MarkMagic User Libraries Let You Secure Your Labels and Forms for SOX Compliance. Worried about Sarbanes Oxley compliance? MarkMagic User Libraries, in combination with the iSeries’ excellent built-in security features, let you control access to labels and forms by user or user group or department or application, etc. Security is improved by the ability to grant different authorities to different User library objects such as label formats and label files. For example, by placing Accounts Payable or Payroll check forms in a protected MarkMagic User Library, you can effectively limit the running of checks to selected authorized individuals. It is advantageous to organize formats, label files, and graphic images by User Library for the following additional reasons, as well: It will be easier for multiple MarkMagic 5 users to find and work with the formats they are responsible for maintaining, and customers supporting multiple sites can distribute User libraries of updated objects without needing to distribute the MRKMAG50 product library. From an OS/400 command line enter STRMRKMAG, and press F4. Type a valid OS/400 library name in the User Library parameter. If the User library does not exist MarkMagic 5 will create it. 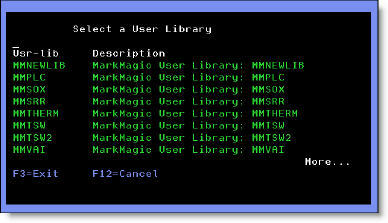 We recommend MarkMagic User Library names begin with “MM” to make it easy to browse all MarkMagic libraries. The first time you work with a User Library, it will be empty —no formats, Jobs, or graphic images will appear when you press F4 for a list. If you need to work with previously defined formats, graphics, or Jobs they must be first exported from MarkMagic or another MarkMagic User Library, and then imported into the new MarkMagic 5 User Library. From an OS/400 command line type EDTOBJAUT (Edit Object Authority), and press F4. Type the name of the Label File you wish to secure and the MarkMagic User Library where it is located. The Object type is *FILE. Press Enter. Change the authorities to the Label File as required and press Enter. If an unauthorized user attempts to print data in that Label File access will be denied. From an OS/400 command line type EDTOBJAUT (Edit Object Authority), and press F4. Type FMTSPF50 and the MarkMagic User Library. The Object type is *FILE. Press Enter. Change the *PUBLIC authorities for FMTSPF50 to *EXCLUDE and press Enter.